In Faenza you can visit one of the world’s most beautiful and complete art collections: the international Ceramic Museum houses pieces from all over the world and from every epoch, from classical amphoras to the works of Chagall and Picasso, and there is a rich section dedicated to Faenza pottery in the golden age of the Renaissance. The historic production of Faenza majolica is recognized worldwide as one of the highest moments of artistic creativity expressed through pottery. The tradition was born from a happy convergence of favorable conditions: a territory rich in clay, a centuries-old history of political and commercial relations with nearby Tuscany (especially with Florence ) and great sensitivity and aptitude with regard to this art form. Over 60 workshops are currently active – most of them in the city center – and offer the tourist the chance of unique purchases unavailable elsewhere. In September and October international contemporary and classical ceramic art events draw majolica amateurs, collectors and artists to Faenza from all over the world. In June the Palio del Niballo, a spectacular tournament between five horsemen from the districts of the town, re-evokes the magnificence and struggles of Faenza in the Manfredi epoch. 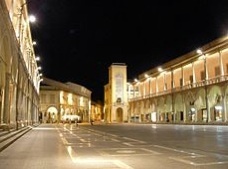 The Florence – Faenza 100 kilometres, a demanding long distance race held during the last weekend in May, attracts athletes of all nationalities. For lovers of good food and drink Faenza offers welcoming restaurants both in the city centre and in the surrounding green hills. Typical regional dishes include home-made tagliatelle, cappelletti, lasagna and strozzapreti with the rich Romagnol meat sauce.